Click here for sample verses from the version by William Newcome. 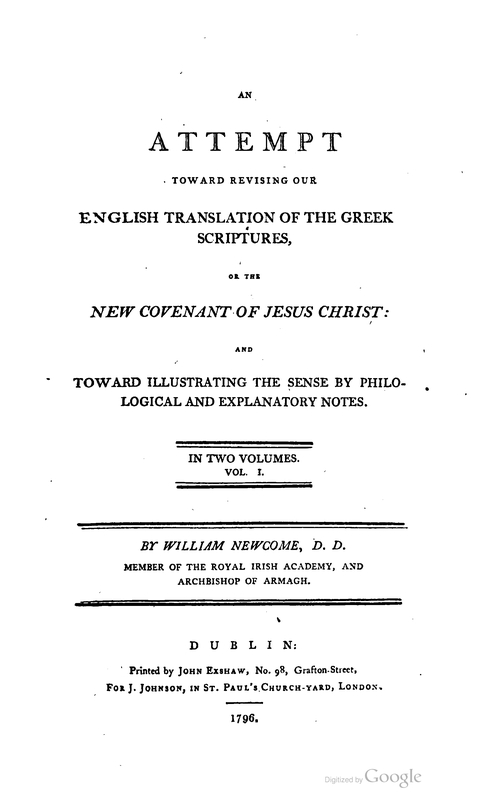 Title: An Attempt Torward Revising Our English Translation of the Greek Scriptures, or the New Covenant of Jesus Christ: and Toward Illustrating the Sense by Philological and Explanatory Notes. In Two Volumes. Vol. I. By William Newcome, D.D. Member of the Royal Irish Academy, and Archbishop of Armagh. Publisher: Dublin: Printed by John Exshaw, No. 98 Grafton-Street, For J. Johnson, in St. Paul's Church-Yard, London. References: Chamberlin 542-3, Herbert 1414, Taliaferro-EELBV 7235. In 1808 a committee of Unitarians led by Thomas Belsham used this version as the basis of their own version with notes, published as An Improved Version, upon the Basis of Archbishop Newcome’s New Translation.